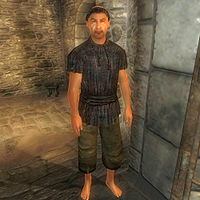 Claudius Arcadia is an Imperial commoner, currently incarcerated in the Imperial City's prisons, who was imprisoned for conducting the Black Sacrament and arranging the assassination of Rufio through the Dark Brotherhood. His house in the Talos Plaza District of the Imperial City has been seized by the Imperial Guard because of Claudius' incarceration and is currently being used as an Imperial Legion outpost; a respawning Imperial Watchman is permanently stationed there. Claudius never leaves his prison cell in-game. He will spend all his time standing at the front of the cell, never eating or sleeping. He wears only a sack cloth shirt and pants. Based on vague comments in Claudius' journal and by Rufio, it seems Rufio killed an unknown female possibly connected with Claudius during an encounter in which she struggled, despite Rufio urging her to stay still; this suggests, at the very least, that Rufio was not just an innocent old man and that Claudius was unable to kill him personally. Talking to Claudius in his prison cell supports this: "So I wanted somebody murdered! So I prayed to the Night Mother! What, is that a crime now? They even took my house, those bastards! Agghhh!" The only person with a copy of Claudius Arcadia's House Key is Adamus Phillida. You can easily obtain the key during the Permanent Retirement quest. Adamus presumably has the key because of his involvement with hunting down the Dark Brotherhood. This page was last modified on 26 December 2017, at 22:50.